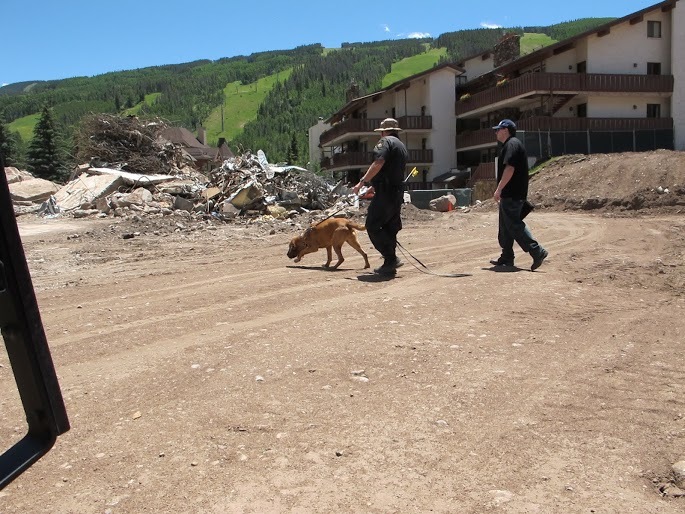 More than two-thirds of a skeleton has been recovered after forensic experts using cadaver dogs unearthed many more bones Monday at a dirt collection site in Edwards where material from a hotel demolition in Vail had been dumped. A canine unit from Elbert County searches for more human remains at a construction site in Vail (Vail Police photo). Construction resumed Monday at the site of the former Lionshead Inn and annex building at 705 W. Lionshead Circle after search teams with recovery dogs from around the state cleared the area. But investigators following up on a search area at the dump site in Edwards identified by dogs on Saturday found many more bones there Monday. Eagle County Coroner Kara Bettis says the additional remains will help with the likelihood of a positive identification, as well as the investigation into the cause and manner of death. The remains will be turned over to forensic experts to attempt to determine gender, age and length of time in the ground. A final search of the site is planned for after the holiday weekend. The remains were excavated from an area not within the building footprint of the old hotels but rather in a utility easement at the northwest corner of the lot along South Frontage Road. According to records provided by the Town of Vail, utilities were originally installed at the site in 1967. Since then, numerous permits for work within the easement have been processed through the years. Officials say the case remains an active investigation. Participating agencies include the Vail Police Department, Colorado Bureau of Investigation, Colorado Fifth Judicial District Attorney’s Office and the Eagle County Sheriff’s Office. K-9 teams from law enforcement agencies in Denver, Elbert, Garfield and Jefferson counties assisted with site searches on June 28on Saturday. In addition, Dr. Melissa Connor, archaeologist and associate professor of forensic science from Colorado Mesa University has been assisting the Eagle County Coroner’s Office in the field.